In the front of our yard sits a homemade backlit sign giving details about the show start times and the radio broadcast frequency for hearing the music (we have actually simplified it now to point people to the website rather than having the show start and end times on the sign). Rose made the “listen to the lights” sign in 2015 out of pvc pipe for the legs, a 1×3 board for the frame, a thin piece of plywood for the back, the glass from an old picture frame (hooray Goodwill), and a white poster board with black adhesive numbers and letters. A single strand of Christmas lights (controlled from a relay in the bomb box) inside the sign backlights the white poster board and provides great contrast in both daytime and at night for reading the sign. Other than swapping out the lettering occasionally, it has held up well and continues to serve its purpose. We have also played with the location some over the years but the current spot is right in front of the big tree. This puts it near the edge of the viewing area so it isn’t too much of a distraction but also makes it central enough that is obvious to visitors that we are broadcasting over the radio. Our “tune to” sign with the FM station of our broadcast and the address of our website. At night, it is backlit by a strand of Christmas lights. 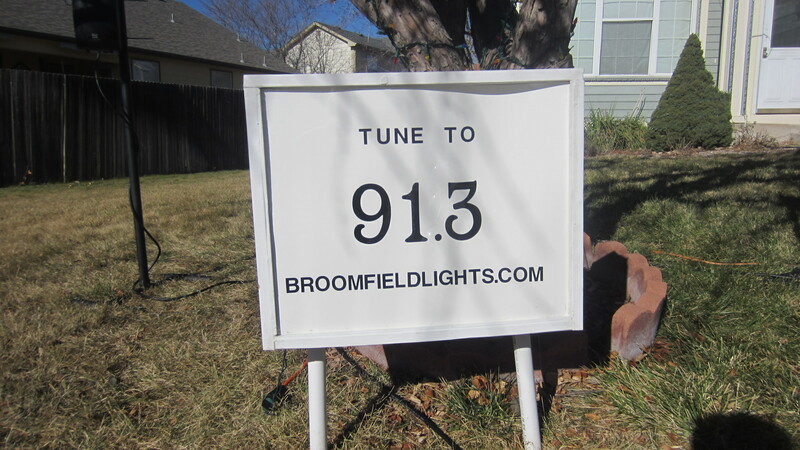 In 2018, Philip built a second sign that lives on the other side of the driveway to make it easier for people to see the radio station as they approach the house. It’s construction is very similar to the original sign and is backlit the same way.